Some time ago, I talked about Andrej Gaj. Today I will tell you about his daughter Anna Gajova. She was born in Presov and has both maternal and paternal Rusyn ancestry. She was very excited to mention that when I asked her about it! She has been exhibiting in Slovakia and abroad (France, Germany, Czech Republic) since 1990 as an academically trained artist who is no stranger to a variety of techniques and genres: landscapes, portraits, action painting, graphics, illustrations, linocuts, etchings, watercolors and drawings. 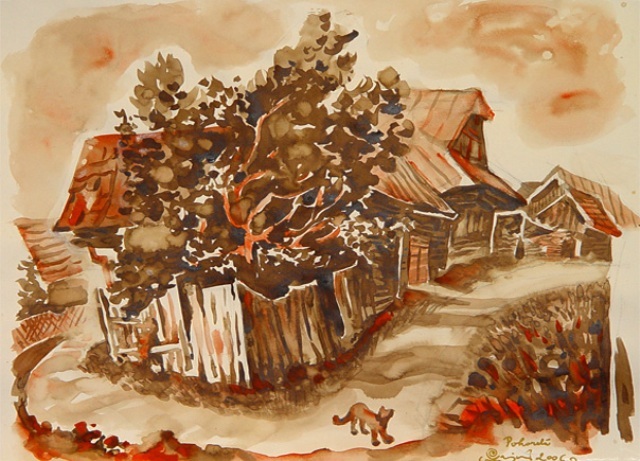 In this small watercolor that belongs to a series of watercolors capturing Slovakian villages you can appreciate the scene from a slightly elevated viewpoint, adore the emotional and exaggerated rendering of the old cottages leaning down under the weight of time, a red and brown color palette that adds so much to evoking the passing of the years, and the golden glow of warmth that thinking about the past often entails.